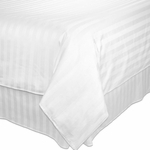 Solid White Duvet Inserts designed specifically for hospitality and commercial lodging use. These easy-care Duvet Inserts have a soft, microfiber outer shell for faster drying and long-lasting durability. To make sure the duvet inserts come out of the laundry looking like new, channel quilting is combined with a resilient, down-alternative Eco-Friendly fiber fill. The Eco-Fill does not shift or clump like you find with many other duvet inserts, so these look great for more washes. For added strength, the inserts are quilted with end-to-end sewn-through stitching, and are then finished with double stitched, self-piping edges for a clean, durable hem. 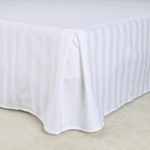 Ribbon loops are sewn into the top corners to easily secure the duvet inserts inside of duvet covers with ties. These fast drying, long lasting, & non-clumping Eco-fill Duvet Inserts are available for wholesale purchase by the case in Twin, Queen and King sizes. Pair your Eco-Fill Duvet Inserts with either the T-250 White Dobby Stripe Duvet Covers or the T-250 White Micro-Check Duvet Covers to create luxury hospitality bedding at affordable wholesale prices. 90 GSM 100% Brushed Microfiber Polyester Shell - Long-Lasting, Fast-Drying Fabric with smooth, Peach Skin Softness. 350 GSM 100% Recycled Polyester Fiber Fill - Non-clumping Eco-Fill becomes reinvigorated when washed and dried. Channel Quilting - easy insert quilting keeps fiber from shifting or clumping when laundered. Double Stitched, Self-Piping Hem - clean hem with double stitching for added durablity and fray resistance. Corner ribbon for securing duvet covers with corner ties. Twin Duvet Inserts - 66" x 84"
Machine wash in warm water on regular or bulk cycle. Tumble Dry on Low - fast drying down-alternative fill and microfiber cover.